As the 2016 Summer Olympics come to a close, I can't help but feel like this has been the Blackest Olympics yet. No, I don't have stats to prove this, but it just feels right. 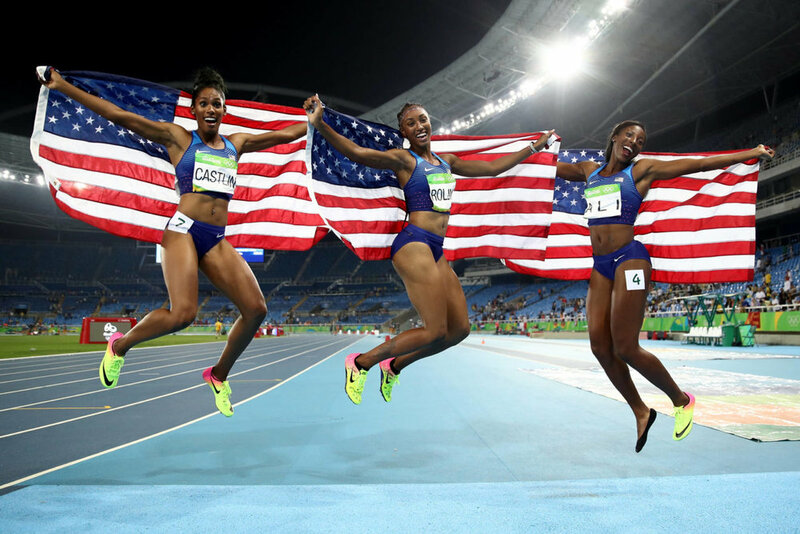 From Simone Biles, Gabby Douglas and Simone Manuel taking gold in their respective sports to Michelle Carter making shot put history and Brianna Rollins, Nia Ali and Kristi Castlin forming the first US women's sweep in 100-meter hurdles, this year's Olympics have been full of #BlackGirlMagic. And I couldn't be more excited! Four years ago, I wrote about why Gabby Douglas is a BFD. As the first Black woman to earn the all-around gymnastics competition, she inspired a whole new generation of little Black girls to go after their dreams, whether it was gymnastics, world records or personal bests. Sure, when I was growing up, there was Dominique Dawes, but there's been a bit of a drought between her reign and Gabby's. Now there are TWO Black girls on the U.S. women's team, a Hispanic girl AND a Jewish girl. To paraphrase a certain presidential candidate, "this is HUGE!" While watching the team compete, I told my husband this is a big deal for Black girls everywhere. There's a saying that "you can't be what you don't see." And while some people have the gumption to become the first Black/woman [insert occupation/record here], there are some who need to see it to believe it. I have a Facebook friend whose daughter, also named Simone, is OBSESSED with Simone Biles. My friend posted a video of her daughter, a young Black girl, prancing around in her leotard while the elder Simone was doing her thing on the TV in the background. I cried. This is why representation is so important. It opens doors and minds to possibilities. Here's a little girl who sees herself reflected in her favorite sport and who knows that she can someday become the best gymnast in the world. Same for the little Black girls watching Simone Manuel dominate the 100-meter and become the first Black woman to earn a gold medal in an individual swimming event, which is perhaps even more significant because of the historic racism Black people have faced when it comes to public swimming areas. Don't believe me? Check out this article about the time a hotel drained an ENTIRE pool because actress Dorothy Dandridge dipped ONE toe in. This is why representation matters. And I bet there are people who didn't even know Black women competed in shot put (myself included). Michelle Carter represents for not only Black women, but full-figured women. And looks damn good doing so, might I add. I mean, do you really want to get on a shot putter's bad side? I didn't think so. And last, but certainly not least, the image of Brianna Rollins, Nia Ali and Kristi Castlin up on that podium with their medals while the national anthem played? Priceless. Pure #BlackGirlMagic. I can only imagine the number of young Black girls inspired by these athletes and I can't wait to see them go after their own gold medals someday. I'll be cheering them on, too. Because until there's a day when there's no longer a first Black or woman whatever, representation will ALWAYS matter.